From the first few pages my heart was racing this ENTIRE book! I'm not going to lie - it's not easy to read. It is so real and raw that you will cry many tears for this heroine and hero, yet at the same time you will become consumed with their love - with their dreams - with their hope, and you will push through all the bad just to get to the good. And there is good!! I don't think I've read a book with a more perfect title....ACHE. My heart ached for them. My body ached for Bea. My female spirit ached for her dreams and desires. 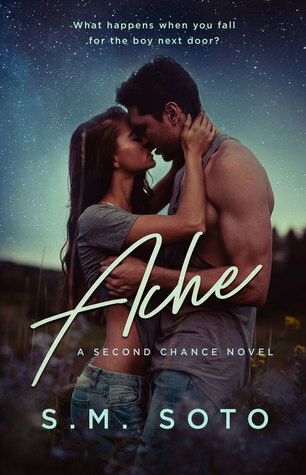 SM Soto brilliantly weaves this one single word "ache" into so many different instances in this story. "I'll never forget the pain I felt that day. It was an all consuming ache." "...she's a shell of the girl I used to know, and my heart aches at that realization." "My belly flips down low with an ache when his tongue meets mine." "Thank me when that ache," she says, gesturing to my chest, "finally disappears." "That sweet, delicious ache brews in my core." "There's a blissful ache in my heart that yearns for her..." This one word held so much emotion and so many different meanings...but they all led back to this broken girl and couple. Bea & Liam epitomize young love...they are drawn to each other instantly, yet their feelings toward one another grow organically over time. They have a string between them that is constantly pulling them together - an energy that makes them aware when the other is near - it is real and raw, and I cheered for these two from early on in their story. From the flashbacks to their younger years to the present, Liam's loyalty and love for Bea never wavers. He never gives up on her, and his fierce passion and determination to "get his girl back" was so endearing that at times it brought tears to my eyes. Bea had truly become a shell of her former self, and throughout her story I remained hopeful that those who cared for her the most would remain loyal to her and stay by her side. She was a fighter - and she was selfless in the fact that she took the punishment to save those she loved from pain. She endured so much, and although at times you want to yell, you want her to run, you want her to scream and fight...you can't judge her. You can't do it for her. She had to get there on her own, and her resilience and perseverence to get her life back was awe-inspiring. Liam's unwavering compassion and loyalty to her, even when he did not have the answers he was looking for, made me fall for him that much more. His own determination, fight and passion for Bea was so real, and exemplified unconditional and everlasting love. This story will break you and slowly put your heart back together as Bea's human spirit starts to heal. I became Bea reading this story - I felt her abuse, her shame, her fear, her self-doubt; but I also felt her undying love from Liam, unconditional love from her best friends and mother, and finally the affirmation and acceptance of a peer who understood her all too well. As a female, and having lived through many #metoo moments, I commend SM Soto for writing such a heartbreaking story with a brilliance and boldness that not many authors are brave enough to do. This story will rip your heart into pieces, but at the same time remind you of the resilience of the human spirit and the strength of true love. There are not enough stars in the sky for these star-crossed lovers who will hold a special place in my book-loving heart for a long time to come! Well done SM Soto! !